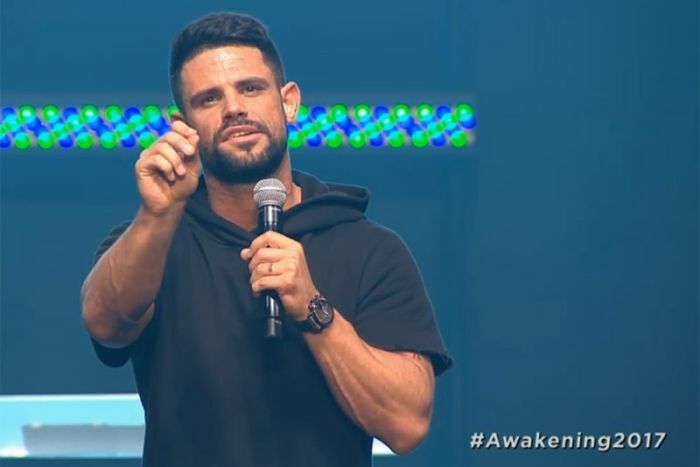 Elevation Church Pastor Steven Furtick will not be leaving his Charlotte, North Carolina, megachurch to join Pastor Joel Osteen at Lakewood Church. Furtick took to social media on Sunday to clarify that a widely read satire piece claiming that he was going to the Texas-based megachurch was untrue. In a video posted to his official Facebook page that as of Tuesday has gotten over 480,000 views, Furtick explained that people need to "consider the source." "They were making it look like I was leaving Elevation Church to go to another church like an NBA free agent for a big contract," said Furtick. "Of course none of that is true. I'm not leaving Elevation Church. The thing was meant to be a joke. Whether it's funny or right for them to post that, that's up to you to decide." Furtick added that he found it "crazy" that so many people "believed it and then even spread it around that I was leaving my church." "And it just reminded me that we got to be careful. We live in the age of information, but we're starving for truth," he added. 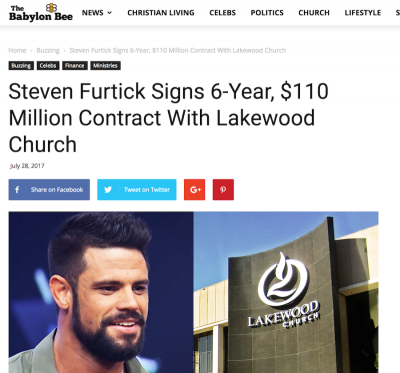 Furtick was responding to a fake story published last Friday by the Christian satire site Babylon Bee that was titled "Steven Furtick Signs 6-Year, $110 Million Contract With Lakewood Church." The satire piece included a fabricated quote by Furtick reading, "I wish Elevation the best of luck in the seasons to come, and hope they can find someone as ripped and godly as me." Other recent posts on the satire site include "Lord Jesus Detained at Border While Attempting Second Coming," "Hillary Pushes 'Free Kermit Gosnell' Shirt for Planned Parenthood Fundraiser," and "Ken Ham Auctions Authentic Photo of His Great-Great-Grandfather Riding Triceratops." As of Tuesday afternoon, the fact-checking website Snopes has 10 entries connected to Babylon Bee stories being taken as fact. "Although the Babylon Bee is open about its satirical nature, some jokes about nuanced aspects of Christian culture go over readers' heads," explained Snopes. "Articles suggesting incarcerated abortion provider Kermit Gosnell was a Democratic National Convention speaker, that Elevation Church acquired a baptismal waterslide, and Californians were required by law to register Bibles as assault weapons all caused confusion among social media users." Furtick is the pastor of one of the largest churches in the country. Elevation Church draws some 20,000 attendees to its nine Charlotte area locations and thousands more online. The megachurch also has campuses in Florida, Virginia, South Carolina and Canada.